I am really stoked about going to see Breakfast on Pluto. Cillian Murphy (he of the lovely long eyelashes) plays a transvestite cabaret performer against the backdrop of IRA bombings in London. Can it get any better than that? I loved Cillian in 28 Days Later (running zombies, yeah!!) but am really concerned for future of his credibility (with me anyway). So many lovely UK actors end up getting lost in the evil Hollywood machinery. I haven't seen Red Eye, but have heard it's a real stinker. My main worry about that particular film is - does Cillian affect a bad American accent. I hate it when that happens. Remember Ewan McGregor before he whored himself to Hollywood? Remember how lovely it was to listen to his thick Scottish brogue in Trainspotting? And then came the string of crap-tastic Hollywood films (Star Wars, I'm looking at you) and no more lovely Scottish accent. I can't really blame him; I'd do the same for a stack of money. Besides what boy could resist playing with light lasers? Breakfast on Pluto should be blissful experience, though. I love the old Globe theatre. It reminds me of the rundown theatre that I used to frequent for midnight showings of Rocky Horror Picture Show in university, except not as ready for demolition. Yes, of course, I went as Magenta. Have you SEEN my hair? 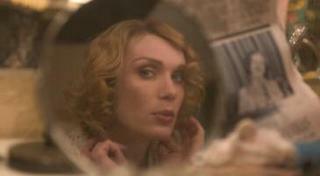 Cillian Murphy is prettier than most women I know, and can you imagine those eyelashes with a bit of mascara?